From Tucson take I-19 south to Nogales, Arizona. 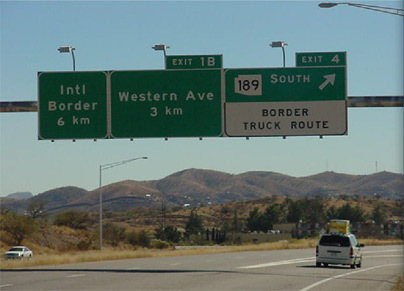 Before Nogales at the border take Exit #4 for Hwy 189, Mariposa Road. This is much faster than going through the Mexican town of Nogales. At bottom of exit turn right. Follow signs to border. Cross border and stay on Mexican Hwy 15. Follow signs to Hermosillo. It's about 3 hours. There is a new bypass for Hermosillo. Just follow signs for Hwy 15 and Guaymas. It is really easy and if you get lost, the locals are extremely friendly. After Hermosillo, it's only 70 minutes to the condos. Before Guaymas, you will see the turn off to the right for San Carlos. Travel about 3 miles and at the first traffic circle, turn left around the circle to head back in the direction you just came. Then make a quick right at the 1st street in circle. Follow signs to Bahia Delfin or Condos Pilar. This road is about 1 mile with a right at the tee. As you approach the Bahia Delfin entrance the road bears to the left and one takes a sharp right in front of the wall to main gate. After announcing your arrival at the guarded gate, take a right to office, check-in and get key.